Alan Tudyk is no stranger to science fiction. He’s best known for his role on the TV series Firefly, but he’s also voiced CG characters in Frozen, Wreck-It Ralph, Moana, and more. And while he’s already played a CGI robot in iRobot, he’s about to steal the show as a robot of a different kind in Rogue One: A Star Wars Story. K-2SO is a 7-foot tall reprogrammed Imperial droid, but that doesn’t mean he takes instruction from human masters well. And Tudyk brings the soon-to-be fan favorite to life on the big screen this week. 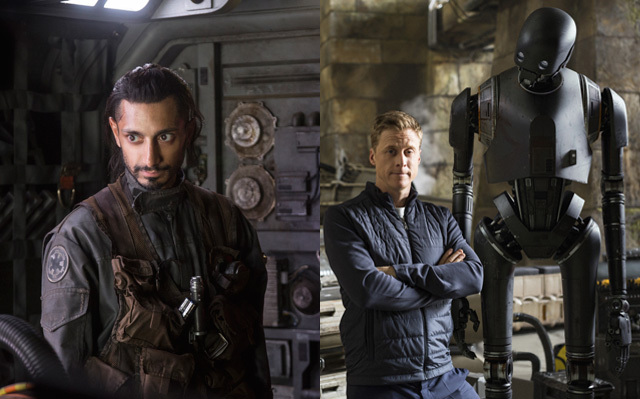 Alongside him is Riz Ahmed as Bodhi Rook. Riz has had notable roles with Jake Gyllenhaal in Nightcrawler and Matt Damon in Jason Bourne, (and he just received a SAG Awards nomination for The Night Of), but his role in Rogue One may be his biggest to date. He plays a defecting Imperial cargo pilot who sets in motions the events of this Star Wars story. The actor / rapper sat alongside Tudyk to talk with me about their adventure in a galaxy far, far away.